New Delhi: The value of transactions through mobile wallets reached an all-time high in May. 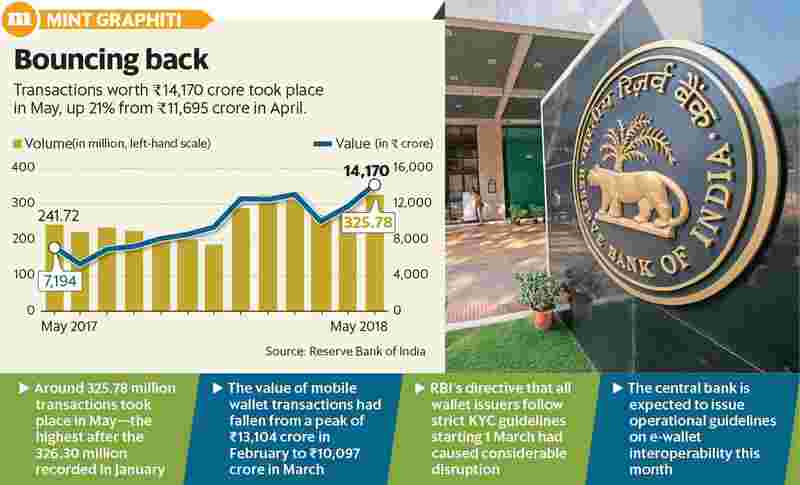 Transactions worth ₹ 14,170 crore took place in May, up 21% from ₹ 11,695 crore in April, according to data released on Friday by the Reserve Bank of India (RBI). The volume of mobile wallet transactions, which fell sharply in March as mandatory know-your-customer (KYC) requirements took effect, has also bounced back. Around 325.78 million transactions took place in May—the highest after the 326.30 million recorded in January. This shows how mobile wallet companies, which were struggling to come up with the necessary compliance infrastructure and convince users to provide the required documentation in March, have managed to claim back their customers. A significant proportion of prepaid payment instrument (PPI) transaction volumes comprises remittances, which have been impacted adversely, said Sunil Kulkarni, joint managing director at Oxigen Services (India) Pvt. Ltd, a mobile wallet and payment solutions company. However, Kulkarni attributed the growth to purchase transactions (of goods and services) where full KYC is not required for up to ₹ 10,000 per mobile wallet customer per month for a 12-month period. “One of the major reasons for growth would have been contributions from select mobile wallet providers offering cash-backs on promoting digital/online transactions using debit cards/credit cards/unified payments interface (UPI)," Kulkarni said. “These providers could continue to credit promotional cash-backs in these minimum details KYC mobile wallets and customers re-used this cash-back amount for subsequent purchase transactions," he said. RBI is expected to issue operational guidelines on interoperability this month. This is likely to increase the use cases for mobile wallet customers and bring it at par with banks. Banks and PPIs have been waiting for RBI to issue the guidelines for several months. Last October, it had issued a directive to banks and PPIs on interoperability, which was to be enabled in a phased manner. It had also said that operational guidelines on interoperability would be issued separately. Debit and credit card transactions have also reached a new peak both in terms of value and volume. The volume of card transactions went up marginally by 1% to 1,238.58 million in May from 1,225.75 million in April. The value of these transactions reached ₹ 3.59 trillion in May from ₹ 3.55 trillion in the previous month. The volume of transactions through mobile banking also reached a peak in May. The transactions went up by around 7% to 266.94 million in May from 250 million in the previous month. The value of transactions increased to ₹ 1.76 trillion in May from ₹ 1.34 trillion in the previous month. Payments using real-time gross settlement (RTGS) increased by around 8% to 11.5 million in May from 10.6 million in the preceding month.